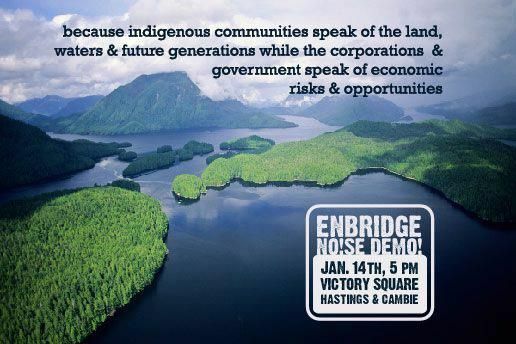 When the Enbridge pipeline joint Environmental Assessment and Energy Board hearings open in Vancouver on January 14th they will be greeted by community members determined to make their opposition heard on the streets and inside the hearing room. A large, noise demonstration will march through downtown Vancouver in full support of the self-determination of Indigenous communities, and their rights to say no to oil and gas pipelines across their territories. The Harper government has gutted Canada's already weak environmental laws, giving cabinet the final say on pipepline projects and making the Joint Review Panel hearings merely a public relations (consultation) exercise. This undemocratic change attempts to remove the rights of communities to say no to big oil corporations. Indigenous communities have already rejected this project and many have repeatedly asserted that their rights to free, prior, and informed consent be respected by both colonial governments and industry. "If Enbridge or any other pipelines decide to proceed with plans to install unsanctioned pipelines through unceded lands they will meet complete and utter defeat. We will resist all of their plans and go to lengths as far as it is necessary for us to so." said Freda Huson, Spokesperson of the Unist'ot'en. The Unist'ot'en Clan have made it clear that they oppose the construction of all pipelines on their territories, including Chevron’s fracking-gas pipeline that would blaze the trail for Enbridge's proposal. 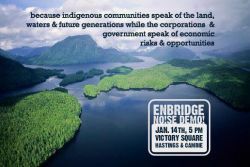 The action will also focus on the Enbridge pipeline’s destructive climate impacts, which have been excluded from the pipeline consultation process. The Joint Review Panel has instructed those participating in the hearings not to talk about climate change since they consider it “outside of the panel’s mandate”. This is a shockingly irresponsible move considering Canada’s tar sands contain twice the amount of carbon dioxide emitted by global oil use in our entire history. "Climate change is having real impacts on people today, from hurricane Sandy in the U.S. to typhoons in the Philippines, killing and displacing hundreds of thousands of people. Frontline communities are courageously opposing extreme energy projects, and our best hope for a just and sustainable future for all of us is to stand behind them." says Rising Tide Collective member, Brigette DePape. “Being silent on the dual threats of oil spills and run-away global warming is no longer an option. I will be making my voice heard on the streets before going inside to speak at the hearing that evening, since the panel members don’t even make the decisions any more.” says Rising Tide Collective member Eric Doherty. This event is being organized by Rising Tide - Vancouver, Coast Salish Territories, a grassroots environmental justice group committed to fighting the root causes of climate change and the interconnected destruction of land, water, and air. WHO: This is a child and family friendly event. To get in touch with endorsers please email Sean Devlin.